Bills Alumni Thurman Thomas will team up with Cheerios Tuesday to celebrate Buffalo being named America's Friendliest City. 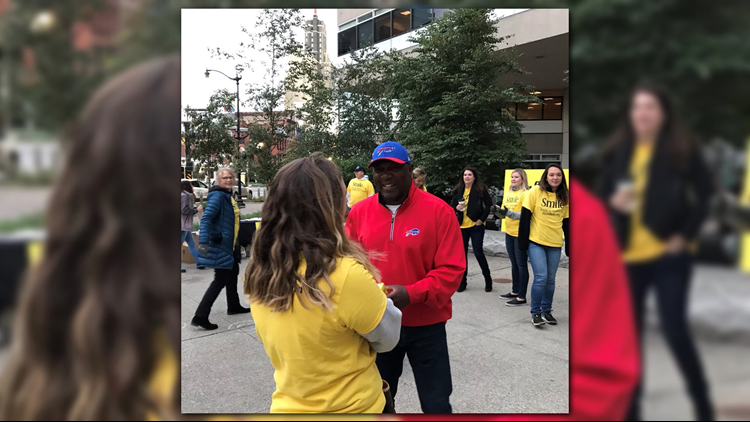 BUFFALO — Bills Alumni Thurman Thomas will team up with Cheerios Tuesday to celebrate Buffalo being named America's Friendliest City. From 7:30 until 9:30 a.m. Thomas will be at Fountain Plaza to greet fans and offer a free breakfast to the friendliest residents in the country. After breakfast, Buffalonians can participate in a virtual high five machine that will connect them with another person across the city for a high five. For every high five given, Cheerios will donate 5 dollars to the Thurman Thomas Foundation, up to $10,000. Today's celebration of Buffalo also carries perks for those who can't make it downtown this morning. Parking meters throughout the city will be free, and Tuesday night the Peace Bridge will be lit yellow to mark the celebration.